Enjoy a 12 day Canadian Rockies Experience visiting beautiful national parks & spectacular Rocky Mountaineer journey before a 7 night luxury Alaska cruise. This morning visit the world-famous Butchart Gardens. Learn about the history and flora while exploring this 22 hectare showplace of colourful gardens. Afterwards enjoy an orientation tour of Victoria’s Inner Harbour, Bastion Square, Beacon Hill and residential areas. Opportunity to take a one hour floatplane flight over the Georgia Strait to Whistler (seasonal, must be pre-booked, additional cost). Drive north to Nanaimo. Board the BC Ferry and travel through the Georgia Strait to Horseshoe Bay. Journey along the Sea to Sky Highway as the road follows the rugged coastline. Stop at the awesome Shannon Falls before arriving at the charming alpine resort of Whistler Village. Discover More: Bear viewing tour with a local expert, or dinner with a twist on a culinary tour. Travel along the scenic Duffy Lake Road lined with thick forest into the town of Lillooet. In the afternoon we head to the picturesque ski resort of Sun Peaks. You’re Invited: This evening enjoy a fur traders feast and presentation accompanied by a tranquil canoe journey. Today you will be rewarded with astounding views as you reach the grandeur of the Canadian Rockies. Weave through thick forests, past meandering rivers, enjoy vistas of the soaring mountains, ice age glaciers and tumbling waterfalls as you make your way through the spectacular Jasper National Park. This morning enjoy a guided walk through the stunning Maligne Canyon. Depart Jasper and travel along the breathtaking Icefields Parkway, acclaimed as one of the most incredible journeys in the world. Make a stop at the Columbia Icefield, North America’s largest sub-polar ice pack where you’ll climb aboard the mighty ‘Ice Explorer’ for a once-in-a-lifetime journey onto the 300 metre thick Athabasca Glacier. Make our way into Yoho National Park to view the spectacular Natural Bridge. Finish the day at the glacier fed Emerald Lake, so named because of the vibrant colour of its waters. Your serene lodge sits right on the shores of the lake surrounded by towering peaks and forest. Visit the famous ‘Diamond in the Wilderness’, beautiful Lake Louise. Spend the morning taking in the stunning surroundings before heading to Banff. Enjoy a sightseeing tour including Bow River, the Hoodoos, Bow Falls and a ride to the top of Sulphur Mountain for incredible views across the Rockies. Today is free for you to enjoy Banff. Set off on a two day rail experience on ‘The Most Spectacular Train Journey in the World’. Settle back in your SilverLeaf carriage (upgrade to GoldLeaf at additional expense). Cross Kicking Horse Pass and view glaciers and snow-capped mountains before arriving into Kamloops. This morning we re-board the Rocky Mountaineer and continue our journey west. Follow the Thompson River, pass through the magnificent Fraser Valley and arrive into Vancouver. You’re Invited: This morning travel to Grouse Mountain and take the skyride to the top. Head to the habitat of resident grizzlies Grinder and Coola and learn about their lives before partaking in a bear inspired breakfast. Set-off on a sightseeing tour of Vancouver including Stanley Park, famous for its totem poles, the waterfront and Gastown. Visit Capilano Suspension Bridge Park suspended 70 metres above the river. Make your way across, then walk amongst the canopy on the award winning Treetops Adventure. This morning board your luxurious cruise ship for a 7 night Alaskan Voyage in your oceanview stateroom on the Golden Princess or Coral Princess. Discover the many services, facilities and activities on offer. Sit back and enjoy the scenery. Canada and Alaska’s coastline reveals North America’s last great wilderness. Keep a look out for wildlife such as orcas, humpback whales and bald eagles. Ketchikan is known as Alaska’s first city because it’s the first major community travellers come to as they journeyed north. Today it’s known as the salmon capital of the world and visitors will be intrigued by its rich Native heritage. Surrounded by the Gastineau Channel, the Mendenhall Glacier and the Juneau Icefields, Alaska’s capital is famed for its scenery and isolation. Cruise into Skagway, the gateway to the Klondike. Enjoy free time to go ashore and stroll along the weathered boardwalks admiring the shop front facades, reminiscent of the gold rush era. Enter the iceberg strewn waters of Glacier Bay National Park, the highlight of the voyage. This breathtaking national park boasts some of the world’s most spectacular tidewater glaciers, such as Margerie Glacier, which often drops colossal chunks of ice into the sea. During your scenic cruise, friendly Park Rangers will join the ship to share their knowledge of this amazing place. Take in the awe-inspiring scenery as you enjoy an unforgettable day of sailing through this dazzling park, where you’ll glide along emerald waters and past calving icebergs and abundant wildlife. Within Prince William Sound lies College Fjord and it’s collection of glaciers, some reaching forty stories above sea level, dwarfing even the largest of cruise ships. Stretching for miles, College Fjords massive rivers of ice tumble down from mountains and through valleys, dipping into the pristine waters. There you’ll have a chance to watch the awe-inspiring process of glaciers calving, or dropping enormous pillars of ice into the sea, as they crack and land with a thunderous splash. College Fjord not only boasts the world’s largest collection of tidewater glaciers, but it features magnificent snowcapped mountains as far as the eyes can see. Disembark in Whittier and travel via the Alaska Wildlife Refuge to Anchorage. After a brief orientation tour of Anchorage, the rest of the day is free. You’re Invited: Visit the home of Iditarod (sled dog racing) champion Martin Buser. Meet the friendly dogs and take a virtual trip along the Iditarod trail including a sled dog demonstration. Continue our journey deep into the Alaskan wilderness arriving in Denali State Park. Nestled in a prime location, this gorgeous lodge is the perfect starting point for your wilderness adventure. Board our full dome railcar on the ‘Midnight Sun Express’ train. Open-air viewing platforms allow you to step outdoors for the perfect snapshot. The highlight this evening is a Music of Denali Dinner Show. Denali is deep in the Alaskan wilderness and this unique location gives you the opportunity to witness the fascinating landscape and wildlife. Embark on a Tundra Wilderness Tour which takes you into the park for a once in a lifetime experience of wildlife viewing and magnificent scenery including Mt. Denali. A narrated history of the park and some of the best opportunities to view wildlife await you on this tour. Continue your journey into the heart of the last frontier, Fairbanks. Fairbanks was founded by miners consumed with the gold fever that swept Alaska at the turn of the century. As gateway to Alaska’s rugged interior, Fairbanks is where the real Alaska begins. Board the only remaining authentic Alaskan sternwheeler ‘Discovery III’ for a cruise along the Chena and Tanana rivers. Get a feel of an old-time steamboat that frequented the river during the gold rush days. Tonight, enjoy a farewell dinner. Transfer to Fairbanks Airport for your homeward flight. From Victoria to Montreal, discover Canada's picturesque national parks, the mighty Niagara Falls and enjoy a spectacular Rocky Mountaineer rail journey. 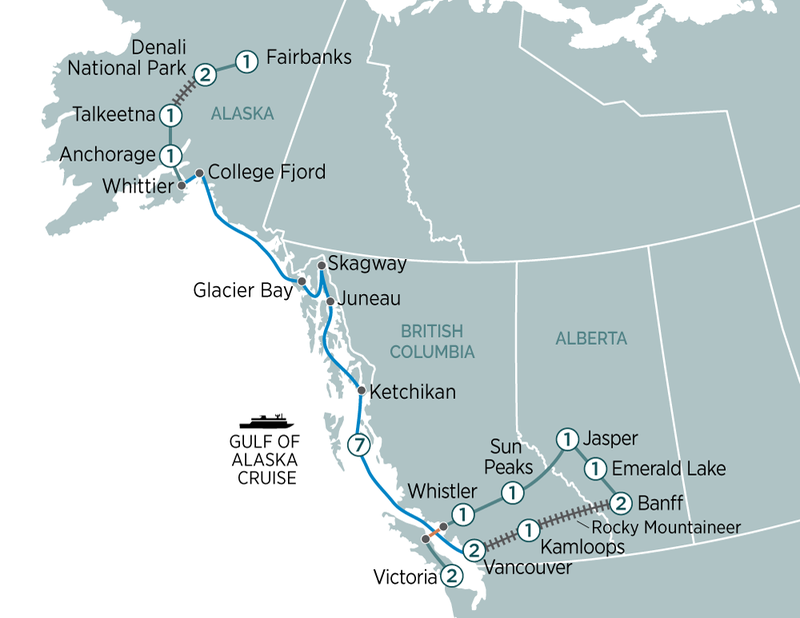 This spectacular 40 day journey includes 2 luxury cruises, a 12 day Canadian Rockies tour, 6 day Alaskan Wilderness experience & 8 day Eastern Canada tour. From Victoria to New York, experience the best of Canada, Alaska & East Coast USA on this 41 day cruise & tour including a Rocky Mountaineer rail journey.